Foil packed for freshness Contains Biotin and B vitamins Free of artificial additives Delicious cat treats Whiskas Healthy Coat Treats contain Bitin and B Vitamins, know to help support a healthy skin and coat. 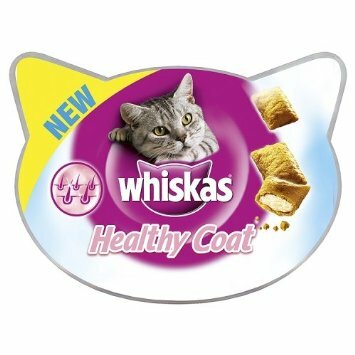 Whiskas Skin and Coat Treats are foil packed for freshness so each treat is as irresistable as the first. Ingredients. Vegetable Protein Extracts, Cereals, Meat and Animal Derivatives, Oils and Fats, Minerals, Derivatives of Vegetable origin. Nutritional Information, Protein 34%, Fat 20%, Inorganic Matter 9.5%, Crude Fibre 1%. Feeding instructions: Feed 15 pieces per day. Use within 4 weeks of opening. Fresh drinking water should always be available.